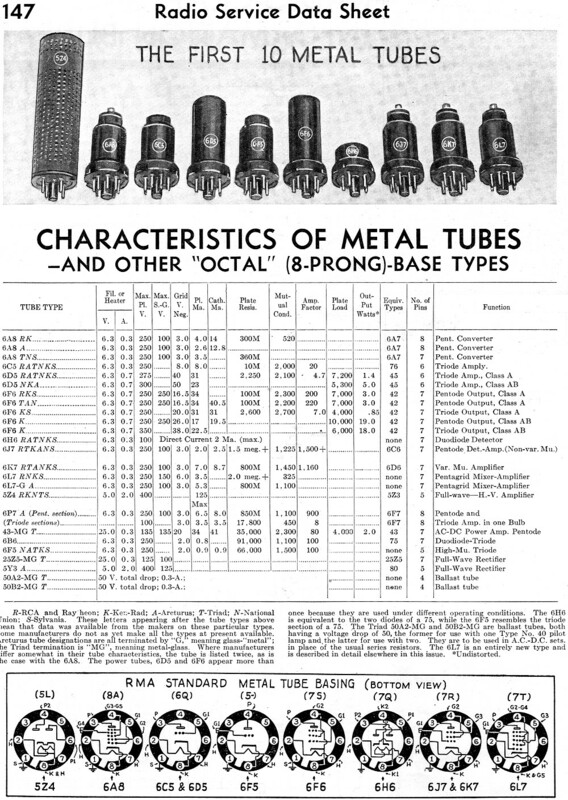 This is a different type of Radio Service Data Sheet in that rather than presenting a schematic and service data on a particular piece of electronic equipment, it provides a table of "The First 10 Metal Tubes" introduced to the industry. As reported in other articles I have posted from the mid-1930s era magazines, the advent of vacuum tubes that used a metal envelope rather than the typical glass envelope was pitched as the most significant advancement in electronics since the invention of the amplifier tube itself (Lee DeForest's Audion) in 1906. 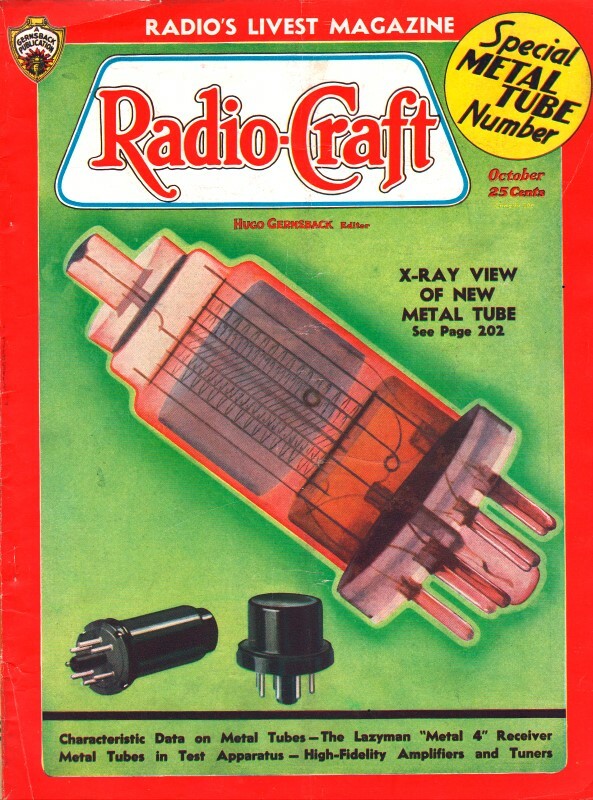 In fact, much of this October 1935 edition of Radio-Craft is dedicated to doting over the metal tube. R-RCA and Raytheon; K-Ken.-Rad; A-Arcturus; T-Triad; N-National Union; S-Sylvania. These letters appearing after the tube types above mean that data was available from the makers on these particular types. Some manufacturers do not as yet make all the types at present available. Arcturus tube designations are all terminated by "G," meaning glass-"metal"; the Triad termination is "MG", meaning metal-glass. Where manufacturers differ somewhat in their tube characteristics, the tube is listed twice, as is the case with the 6A8. The power tubes, 6D5 and 6F6 appear more than once because they are used under different operating conditions. The 6H6 is equivalent to the two diodes of a 75, while the 6F5 resembles the triode section of a 75. The Triad 50A2-MG and 50B2-MG are ballast tubes, both having a voltage drop of 50, the former for use with one Type No. 40 pilot lamp and. the latter for use with two. They are to be used in A.C.-D.C. sets.